Normally I like to do a review at the end of each year, looking back at what I have achieved and how that compares to the goals I set myself at the beginning of the year. However, this year I do not feel like I have achieved very much as other events, including work but mostly the pending property move, have taken up much of my spare time. This year I set myself the goal of keeping my intentions simple and "just do what inspires me". I said I would try not to commit to too many events and concentrate on developing my dot mosaic technique and creating some great artwork I can be proud of. When I look back, I have done this but just not as much as I would have liked. I have created a few dot mosaic pieces, some of which I have not yet shown here as they are entries in the 2015 International Polymer Clay Awards. The deadline for this competition was extended from 31 October to 31 December 2015, so the judging has not yet taken place. Originally we were hoping to have moved into our new place before Christmas but this has now been delayed until January (fingers crossed). 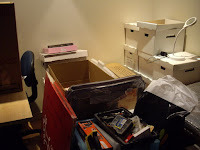 I am finding it very frustrating at the moment, everything is packed (as we have family visiting for several weeks in the New Year, just before we move) so I cannot do anything creative, yet I have so many ideas going round in my head. I will just have to be patient. Once we have moved and get settled in, my new studio space should be so much better. For this reason, I am not setting myself any goals for 2016. It will be a year of transition, settling into our new home and getting familiar with new surroundings and hopefully finding new opportunities. I am hoping 2016 will be a positive turning point in both my home and creative life. I was thrilled to receive an invitation, at the end of last month, to submit works for consideration to be included in a new book series (to be published annually or bi-annually) called Polymer Journeys. The book is being published by Sage Bray, publisher of the The Polymer Arts magazine, so I know it will be a high quality book. I have three pieces that I consider worthy that also meet the date of creation criteria (unfortunately a fourth piece could not put forward as it is a current entry in the 2015 IPCAwards, which is still in the judging process). My submissions were made tonight. I now need to wait until 15 January, when notification of the selected images will be made. Keeping my fingers crossed! For the last few days I have had an idea going around in my head and could not sleep the night before last as the inspiration was flowing. 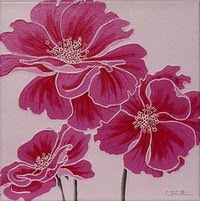 So, this morning, I have purchased the domain name www.art-stonz.co.nz. It is very frustrating at the moment, as I am supposed to be packing up my studio for moving house in January. I will have to be patient with putting the ideas into action, as there will be a lot to do setting up our new home once we have actually moved - but I am always thinking ahead! It may be many months before this next venture gets up and running, hopefully in time for Christmas next year. So I will say no more now as it is still a work in progress but I am hoping that if this idea works out, it could satisfy all my creative needs and provide some income. Tonight was the opening night of the Members Merit Awards Exhibition at the Lake House Arts Centre. My two entries are 'Green Kiwi' and 'Watching the sunrise over Rangitoto'. 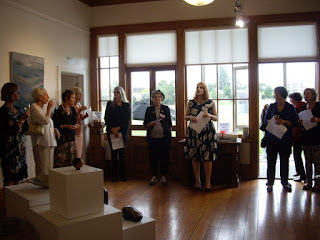 I did not get an award at the presentation but can always hope for the People's Choice Award at the end of the exhibition, which I won in 2013. To help clear my studio for moving house, all items have been reduced. 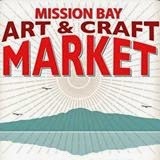 Your chance to buy original polymer clay gifts, all hand-made by myself - some definite bargains to be had. 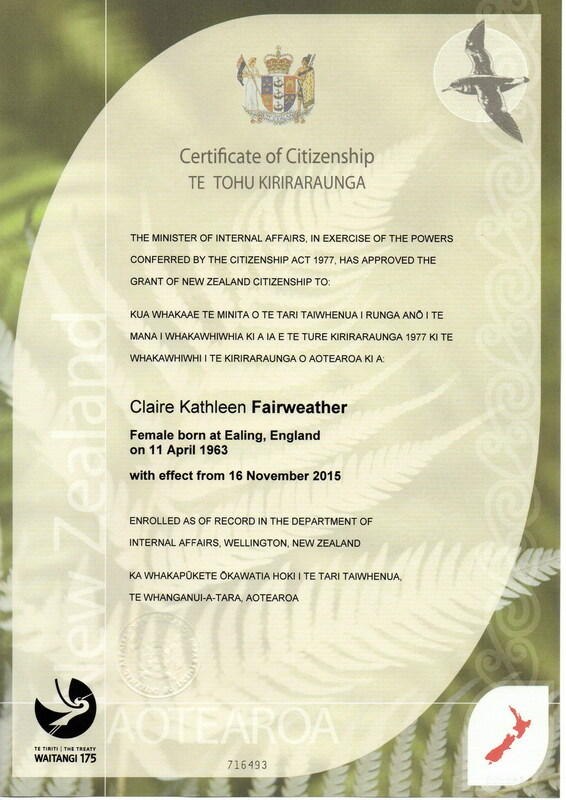 Tonight my husband and I became New Zealand citizens. After arriving in March 2009 and making New Zealand our home, it is good to feel that we really belong now. Today I have submitted my 3 entries for the 2015 International Polymer Clay Awards, well ahead of the deadline for submissions of 31 October. The theme this year is 'In the Round'. I have two entries in the 'Non-functional Sculpture and Hanging Art' category and one entry in the 'Functional Containers' category. Unfortunately I cannot post any photos of my pieces until after the competition has been judged, which will be later this year. Now I will just have to wait with interest to see which entries get short-listed, and, if any of those are mine. Sorry I cannot post any photos of what I am working on at the moment. I have nearly finished my three entries for the International Polymer Clay Awards 2015 but until the competition has been judged, later this year, I will have to keep my work under wraps. Very pleased with the mosaic picture I have just finished and hoping my last piece works out as I had planned. 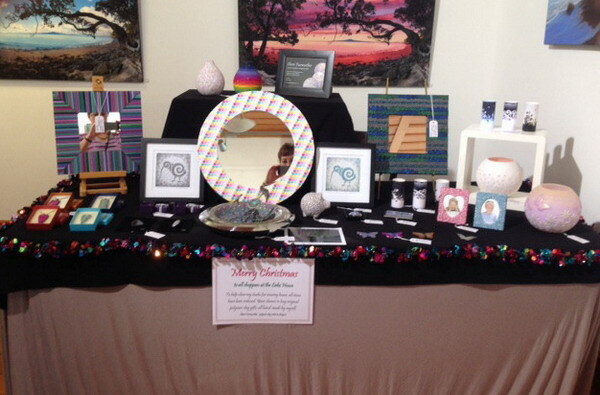 At our last Auckland Polymer Clay Guild meeting, we decided to meet every other month rather than monthly. 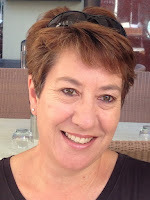 Still on the first Tuesday (see dates below) at The Coffee Club, Takapuna from 6.30pm. 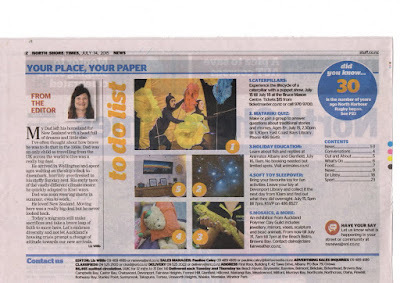 Picture 5 on the 'to do list' shows my work at the July Exhibition at Beach Bistro. 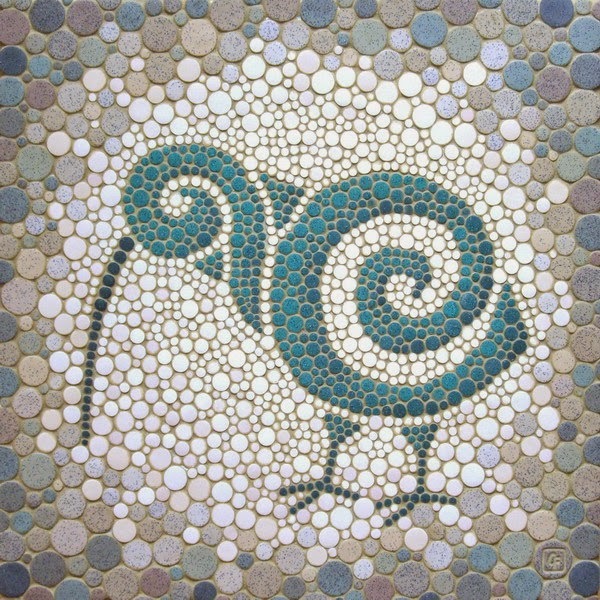 What an honour to find out that my 'Watching the sunrise over Rangitoto' mosaic artwork was featured on The Polymer Arts Blog today. Local polymer clay artist, Claire Fairweather, is showcasing her first large mosaic artwork at the July exhibition at Beach Bistro. Titled ‘Watching the sunrise over Rangitoto’, this local scene is made up of about 6,935 handmade round polymer clay tiles. The whole artwork measures 102cm wide by 40cm high and forms the centrepiece of the exhibition. “It turned out to be a labour of love but I am proud of the end result,” says Claire “I had no idea how long it would take to complete. In the end I spent over 150 hours and finished it just in time for the exhibition. This is a view that I love and I have enjoyed every minute of the making of this artwork”. 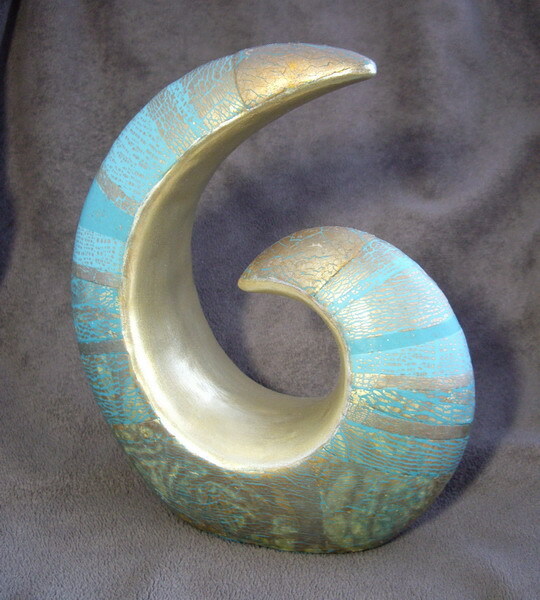 Claire won a ‘Best in Sculpture’ at the 2014 International Polymer Clay Awards for a three part sculpture titled ‘Spring Trio’, which was sold at a previous exhibition at Beach last year. 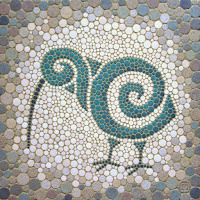 Since then she has been developing her own unique style of contemporary mosaic art, making her own round mosaic tiles from polymer clay. ‘Mosaics, Jewellery & More’ is a mixed exhibition that has been put on by five members of the Auckland Polymer Clay Guild - Claire, Joy, Kesten, Nicky & Sue. 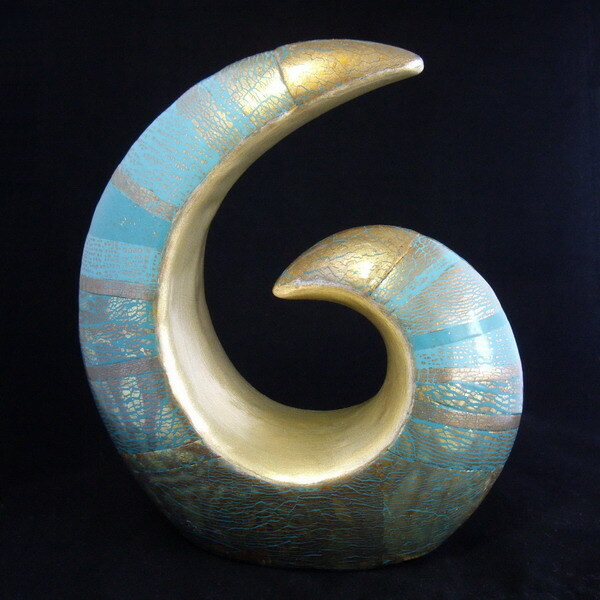 Polymer clay is a very versatile creative medium, which is shown in this exhibition by the diverse range of work from the five different artists. 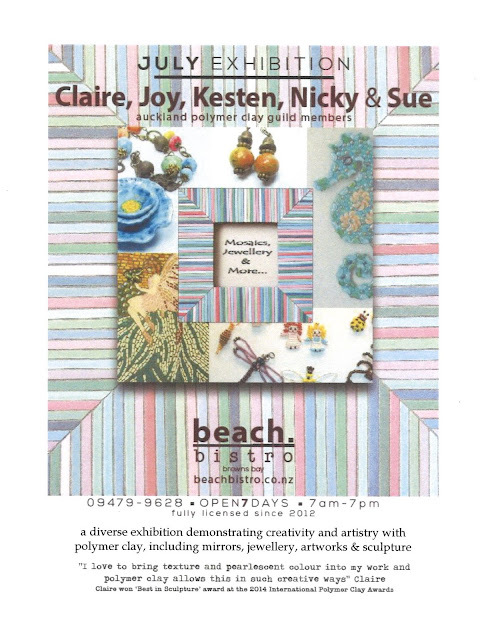 There is jewellery, mirrors, mosaic art and sculpture on show throughout the month of July at Beach Bistro, 1A Beach Front Lane, Browns Bay, open from 7am – 7pm, seven days a week. Here it is, my first large 'dot mosaic' artwork. It is made up of about 6,935 tiles and took over 150 hours to complete. Each tile has been handmade, from polymer clay, and glued in place on the canvas before being grouted with coloured acrylic modelling paste. The story behind the picture: One morning when I left home early, I saw this beautiful sunrise over Rangitoto from the beach reserve at Browns Bay [Auckland, New Zealand]. I immediately thought this would make a great picture, as I love this view, and I will so miss it when we relocate. I took some photos on another day, for reference purposes, particularly to show the outline of the vegetation that I planned to use in the foreground of the picture. There happened to be this couple, sat on the edge of the reserve, in one of my photos, and so I decided to include them in this picture for added interest. Here is another photo taken with different lighting, although the colour is not so true, it shows the textural surface of the tiles better. Counting the tiles: I knew someone would ask me how many tiles were used to create this picture, and I was curious myself, so I spent several hours this weekend counting them. Here is my counting copy. I was only going to do it once, so I wrote on a photocopy (two A3 sheets joined together), numbering each tile as I went, just in case I lost count. The thick black lines mark blocks of 500. I am fairly sure I counted them all and, give or take a couple, there were 6,935. The five of us got the exhibition hung last night. It runs throughout July from 7am - 7pm, seven days a week, at Beach Bistro, 1A Beach Front Lane, Browns Bay, Auckland. 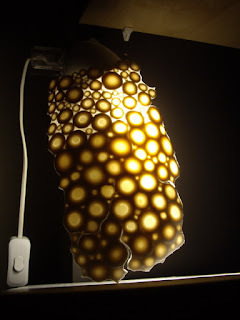 Ever since my return from the IPCA Conference in Malta last year, I have been wanting to create a hollow form with translucent polymer clay, to use as a lampshade for an electric light. 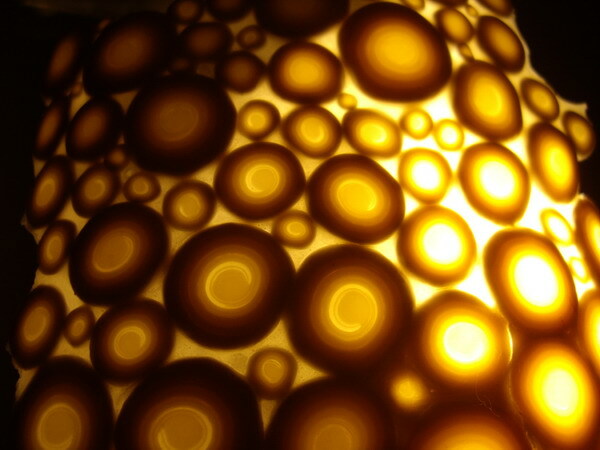 My initial experiment, on a small scale, using a polystyrene ball for the form slumped in the last stages of baking. I did not think it was worth pursuing on a larger scale and so I went back to my original idea of creating the shade over a glass form and then removing it when baked. Here I am using a glass vase for the form. I made several different sized jellyroll canes with sheets of skinner blend of white/pearl mix to translucent, rolling the sheet up so the translucent end was in the centre. I then cut lots of thick slices from the canes, about 2mm thick, and covered the glass vase making sure that the cane slices were touching each other. 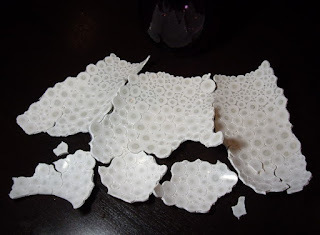 After baking, I filled all the gaps between the slices with polymer clay grout. As I was running out of translucent clay I only used this for the top part, for the rest I used white Premo. I had a brand new block, which was extremely soft, in fact so soft it was easy to use as a grout without the need to mix it with liquid polymer clay. I then baked it all again. When I held it up to the light, even on the dark purple glass vase, I could see the light coming through the translucent parts and it looked great. So then came the exciting but scary part, removing the polymer from the glass form. 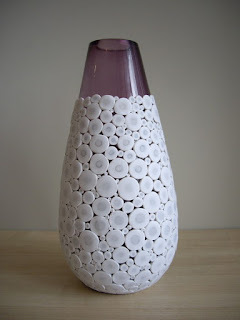 Due to the shape of the vase, which I thought would look good as a lampshade I could not prise the polymer off in one piece. So, I decided to cut it down each side, following the shape of the circular canes, so hopefully I could glue the two halves back together with the seams not showing too much. I thought I would do it while it was still warm, so it would be more flexible and easier to remove. Unfortunately, DISASTER! 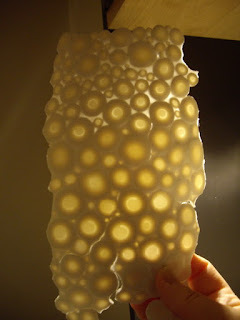 The large pieces of polymer collapsed and split and this was the end result. Maybe the thickness was not great enough to support the size of the lampshade, but I would lose the translucency if I made it too thick. Or should I have waited until it was cold and more rigid to remove it from the glass form. Looking at the hours of work and wasted polymer clay lying on the table in front of me, I noticed that where I had used the translucent polymer clay for the grout, it was holding together fine, it seemed like it was where I had used the new packet of white Premo for the grout that it was very weak and brittle (and I had conditioned properly, with some difficulty as it was so soft and sticky). I held some of the pieces up to the light and thought this could have been so good if it had worked. I was planning to use a colour changing light bulb in the lamp base and include it in the July exhibition at Beach Bistro. Maybe I will have another go some time, when I get over the disappointment, but for the moment I will get back working on my mosaic pictures. 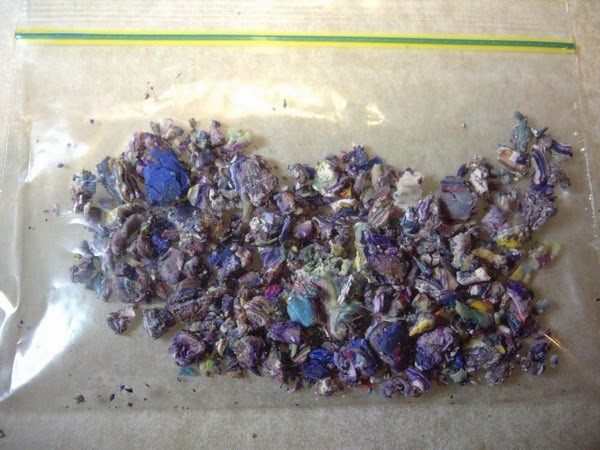 OMG - five years of polymer clay! For some reason when I was working at my pasta machine today, I bent down and happened to look up, I could see some lumps of polymer clay wedged near the rollers so carefully started to prise it out with a plastic tool. The more I pulled out the more that kept appearing. Half an hour later and a strained wrist, as it was not easy to reach, this is what I pulled out. I have been using this pasta machine for five years (and have never taken it apart to clean - obviously!). I somehow could not bring myself to throw those scrap pieces away, they are a part of my polymer clay history - maybe I will turn them into something one day. I had forgotten that Trish had asked me if she could use the photo. 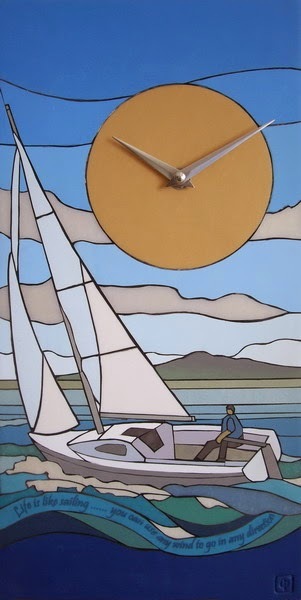 Post Script: I sold the clock - "Life is like sailing..."
I am having a spring clean of my studio, to make room for my new large scale dot mosaics. 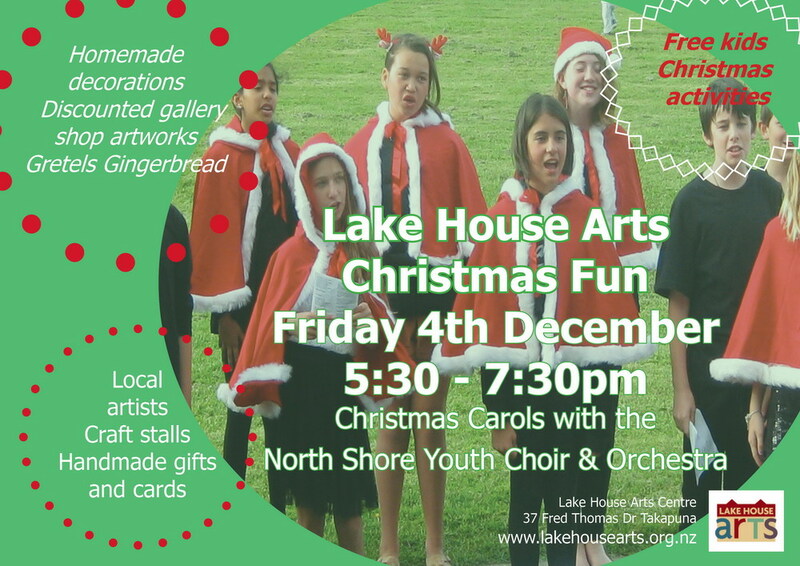 So, I will be selling off a selection of artwork, sculptures and jewellery, at less than half price, at this event. 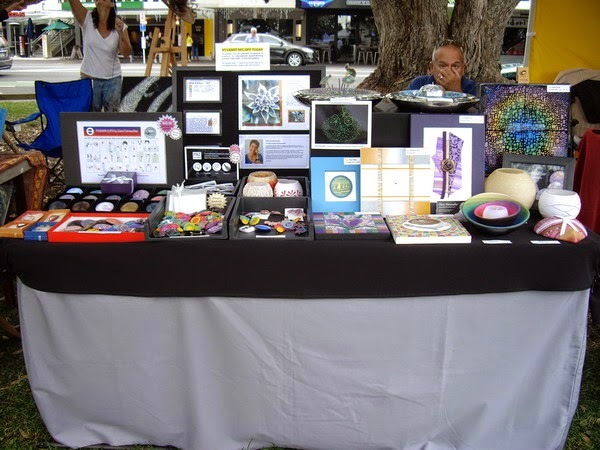 This is a great opportunity to pick up some unique polymer clay pieces at bargain prices. Get there early because once they are gone, they are gone! The event takes place on the Selwyn Reserve at Mission Bay, Auckland on the 26 January (Auckland Anniversary Monday) from 10am - 4pm. This year I intend to keep my intentions simple and just “do what inspires me”. I will try not to commit to too many events and concentrate on developing my dot mosaic technique and creating some great artwork that I can be proud of.